The impact on parents and siblings when a family member has a learning disability was explored in a show at this year’s Edinburgh Fringe Festival. 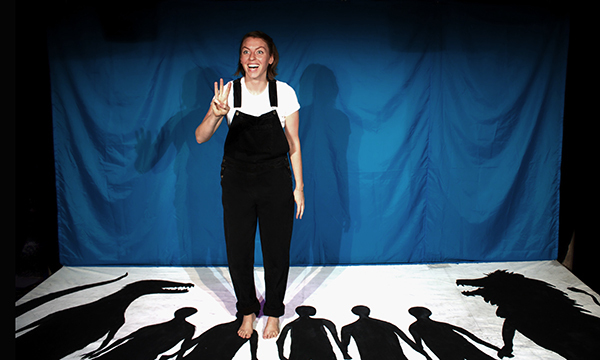 Dangerous Giant Animals, written and performed by Christina Murdock, is informed by her experience of having a sister with Rett syndrome, a rare genetic disorder that affects brain development, resulting in severe mental and physical disability. In the play Kayla, the youngest of three sisters, has an atypical form of the disorder, which means her muscles have been affected by cerebral palsy, she can feed herself, but can’t do up her shoes, and she can say short words, but not long ones. Kayla also has severe epilepsy, experiencing as many as ten absence seizures an hour, and is prone to sudden, violent tantrums. We see the family through the eyes of Claire, the middle sister, played by Murdock, who lets us know what it’s like for her and her older sister Monica and their parents. Some early hope that Kayla’s prognosis may improve dramatically if the family can get her to talk by the time she is six comes to nothing and they are forced to accept that while Kayla’s body will grow up, her mind won’t. Claire is five years older than Kayla and has been coached in what she must do to calm her sister when a tantrum erupts. Claire knows she must divert and distract Kayla, entertain her and make her laugh, scare her, talk about dinosaurs, sing to her, keep her moving. Above all, she is told, don’t let her get to you, and ‘never meet force with force, Kaya will always win as she’s prepared to go further than you’. We also see the fun side of Kayla, the little girl who loves playing peek-a-boo and being spooked, drinking cola and eating cake, and is comforted by dangerous giant animals such as dinosaurs and lions. Eventually the home situation becomes unsustainable, her parents divorce and Claire and her mother take Kayla to a residential facility, enduring a dangerous car journey en route in which Kayla puts all their lives at risk through her violent behaviour. From early on there are fleeting references to something bad that happened. Claire eventually describes a shocking moment when, in desperation, she does hit back. Kayla is almost 12, and not a little girl any more. In the throes of a tantrum she is trying to hit, kick, scratch and bite her sister, and Claire pushes her to the ground and kicks her between her legs. Claire is immediately distraught and remorseful, but realises she can never speak about what she has done as she might face criminal charges. Murdock performs with passion, generating tension that mirrors the family situation, and the denouement – although half-expected – is still shocking. Her portrayal of a sister under relentless pressure is assured and moving. She conveys the real hell so many families experience. Murdock is writing from a north American perspective, and although her play is about a family with no apparent support, in reality there were organisations that helped her family.